Friday’s jobs report was slightly below the estimates from analysts but still registered more than 200,000 new jobs for the ninth straight month and job growth in private sector for 56 consecutive months. 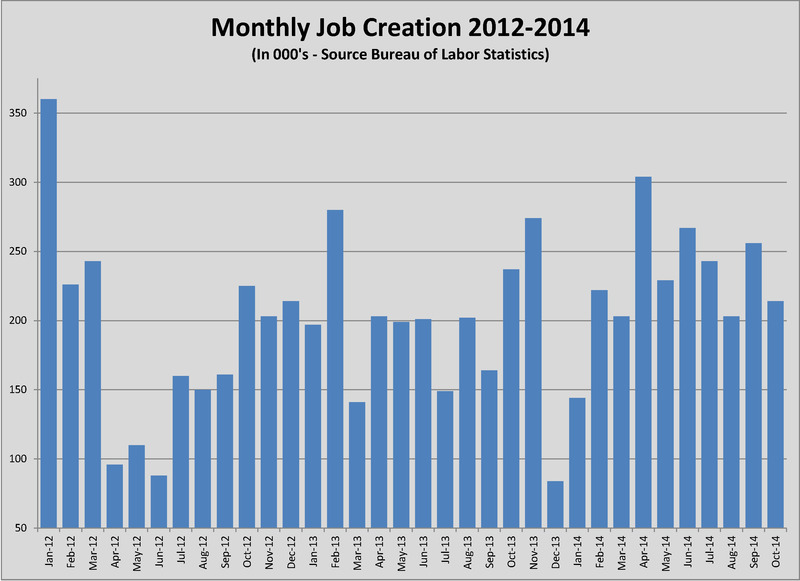 The BLS data showed 214,000 new jobs across all sectors and unemployment declining to 5.8%. This data is on the heels of ADP’s report earlier this week of private payroll employment growth of 230,000 jobs in October. Among economists there is a sentiment that the employment picture has hit a tipping point of momentum that will increase in 2015. There is another tipping point that is upon us as well; that is wage growth. Throughout the job growth cycle of the past few years, wages have remained stuck behind the rate of inflation. This stagnation has a limiting effect on the spending and saving that consumers do. Since consumer spending has picked up to pre-recessionary levels, I’m left to conclude that savings has not followed, which is not a good thing. As employment growth pushes unemployment towards the 5.5% threshold, a likely prospect in early 2015, demand for new workers will put irresistible pressure upward on wages. We are seeing this in construction already and the market needs to adjust its expectations. By market I mean owners of projects. Competitive pressures have kept construction prices aggressive since 2009. Owners are beginning to see higher prices now, depending on what contractors they have asked for numbers. This is especially true in the specialty contractor segment. Construction projects are justified by a pro forma projection of return on investment that starts with the cost of the building at occupancy. Land prices have risen. Site costs have gone up more than inflation. Building costs are going to have to follow within the next 6-12 months. That means owners will have to adjust rents, the horizon for return on investment or the rate of return. If your pro forma is built upon 2013 or even 2014 prices, you may want to revisit it, or build sooner. Rising wages are on balance a good thing. More workers making more money improves the business climate and the rationale behind the construction project in the first place. But there will probably be a balancing period while owners, contractors and occupants adjust their expectations. You can wish the market were not moving higher but markets dictate rather than follow.